Located in a private low rise complex, this modern first floor 2 bedroomed apartment has a south facing balcony for all year sun with table, chairs and parasol. This recently completed property is maintained to a high standard and is only a few minutes walk to the blue flag beach of La Zenia. The bright and spacious lounge has seating for 5 with TV (UK satellite channels), radio/CD/MP3 (via USB) player. The dining area has a table and 4 chairs and leads into an open plan kitchen complete with hob (4 hotplates), oven, fridge-freezer, washing machine, coffee maker, kettle, toaster etc. The apartment has air-con. complete dining service, cutlery, glasses, pots/pans. Iron & board, hoover, hairdryer, duvets to all beds, bedsheets, covers, bath and hand towels per person. Both double and twin bedrooms have fitted wardrobes with the double having air con., safe and window to private balcony. The bathroom has WC, bath with overhead shower, washbasin and cupboard. Communal pool/jacuzzi. Located in a private low rise complex this modern first floor apartment has a south facing terrace for all year sun with table , chairs and parasol provided and overlooks the central courtyards and pool of the estate. Wheelchair accessible - as there are lifts available. The apartment has its own underground parking space. Beautiful clean sunny apartment home from home! Although chilly weather we had a lovely time. Very close to beach bars and restaurants. Will be booking again soon. Thank you Rita. Hi Irene - Thank you for taking the time to submit a review for our apartment. I am glad you enjoyed your stay as you are quite brave going in January, but it is so lovely when the sun shines, especially on the sheltered balcony. We have sat outside there at Christmas time in the winter sun! We look forward to welcoming you back. Spacious and well Equipped Apartment very well situated only 5 minutes walk to the beach, Bars and restaurants on the door step which are lovely.Airport pick up from Tracey was Excellent and she was very helpful. Just a suggestion maybe there should be some beach chairs/beds in the apartment to use on the beach and round the pool. Thank you Rita we would definitely use this Apartment again, we all had a great holiday. Thank you you Shane & Tracey for taking the time to submit a review and we are so pleased that you enjoyed your stay. We have taken on board your comments regarding beach/pool chairs, which we certainly will look into if we can find enough storage space for them. We look forward to you returning in the future. Highly recommended, the reception service was excellent and very flexible regarding our arrival and departure.The apartment itself is centrally located within 5 minutes of both the beach and a number of restaurants. Thank you Jamie for taking the time to compose a review. We are very pleased that you enjoyed your stay in our apartment and welcome you back in the future. Thank you Monica for taking the time to compose a review. We are delighted you had a nice holiday and would welcome you back. Lovely clean well furnished apartment with everything you need. Only thing we missed was sunbeds/chairs, both at the pool and on the beach (due to a local issue). Other than that simply perfect . We would have no hesitation in returning . Airport pick up from Mark and Tracey was 1st class and they were extremely helpful. Thanks Rita for the use of your little gem !! Hi Stephanie - Thank you for your lovely review. We are so glad you enjoyed your stay at our apartment and hope you will return one day. Very clean apt.cosy feel and lovely sunny balcony...... central to all amenites. We really enjoyed our stay and would recommend apt. Suggest owner leave a few beach chairs for guests use. 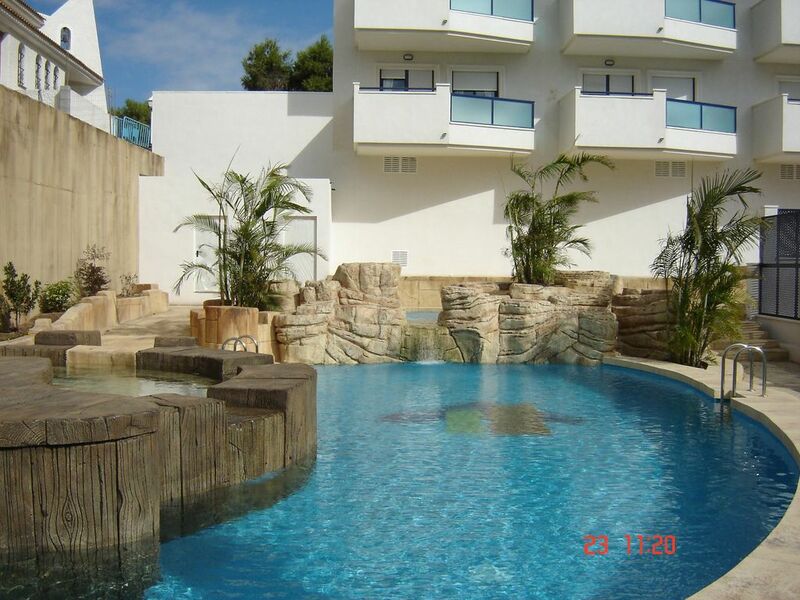 The apartment is a 3 minute stroll along a quiet street to the beautiful La Zenia beach. A wide choice of restaurants and bars are to be found in the immediate vicinity as well as supermarkets, chemist, banks and internet cafe. There is also a very useful 24 hour shop just round the corner and five minutes walk away is the famous Paddy's Point bar. A 2 minute walk away is the bus stop for Torrevieja - a 15 minute ride away. A couple of streets away is the small Orihuela Costa leisure resort which includes a large swimming pool, gym, tennis courts, pool-side bar and restaurant. In the vicinity you have amenities for golf, water ski-ing, windsurfing, cycling, scuba diving, jet-ski, long sandy beaches and an aqua park, 3 top class golf courses (Villa Martin, Las Ramblas and Campoamor) are within a few minutes drive. Nearest airports - Murcia (20 minute drive) and Alicante (45 minute drive). Car not necessary. The new ZENIA BOULEVARD Mall is a wonderful shopping and eating experience. Newly opened, it is a 15 minute walk from the apartment and has many marvellous shops and restaurants. Apart from lots of designer shops, there is a Zara Home, Laura Ashley and Primark. There are numerous coffee shops, as well as lots of restaurants on a different level. In addition a cleaning/linen charge of 50 euros is payable to agent on arrival. A 20% deposit (non-refundable) is required to secure a booking.